Thomas Robarge, AIF, RICP, is the principal at Optimum Retirement Solutions. With a career in financial services that spans nearly 20 years, he is passionate about helping his clients set and pursue their retirement planning goals. As an Accredited Investment Fiduciary (AIF) and a Retirement Income Certified Professional (RICP), Thomas also holds his Series 7 and 66 securities licenses with LPL Financial. By taking the time to listen and understand his clients needs, he designs strategies that are truly customized and comprehensive. 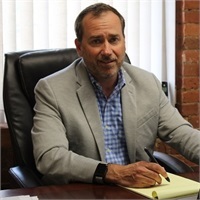 With his extensive knowledge and experience, he seeks to combine with the latest industry innovations to deliver optimized retirement strategies to individuals, business owners, and corporations. Having spent the majority of his career providing retirement plan services, Thomas has served on the front lines of retirement planning and is eager to share his insight with new and existing clients. It is his belief that everyone can and should have a strategy that is tailored to their situation so that they can seek to generate income throughout retirement. Thomas currently resides in Stonington, Connecticut with his wife of twenty years and their two daughters.